Live performance Corpo Insurrecto by Guillermo Gómez-Peña, Balitronica Gómez, Roberto Sifuentes, Dani d'Emilia and collaborators. La Pocha Nostra. Guillermo Gomez-Pena and Balitronica in Corpo Insturrecto. Venice International Performance Art Week (2014). Photograph by Monika Sobczak. Trans-disciplinary, extreme, anthropologic, experimental, open, cross-cultural and cross­-generational, intensive, eclectic, exposed, political, chicanos, rebel, illusionary: it is La Pocha Nostra’s desire to cross and erase dangerous borders including those between art and politics, art practice and theory, artist and spectator, ultimately to dissolve borders and myths of purity whether they be specific to culture, ethnicity, gender or language. An ever growing cross-disciplinary arts organization and non-profit that has been founded in 1993 by Guillermo Gómez-Peña, Roberto Sifuentes and Nola Mariano in Los Angeles, with the goal to formalize conceptually Gómez-Peña’s collaborations with other performance artists. Core members of La Pocha Nostra include Guillermo Gómez-Peña, Roberto Sifuentes, Dani d'Emilia, Michelle Ceballos Michot, Saul Garcia Lopez, Erica Mott, Violeta Luna, Brittany Chávez and over 30 associates worldwide. 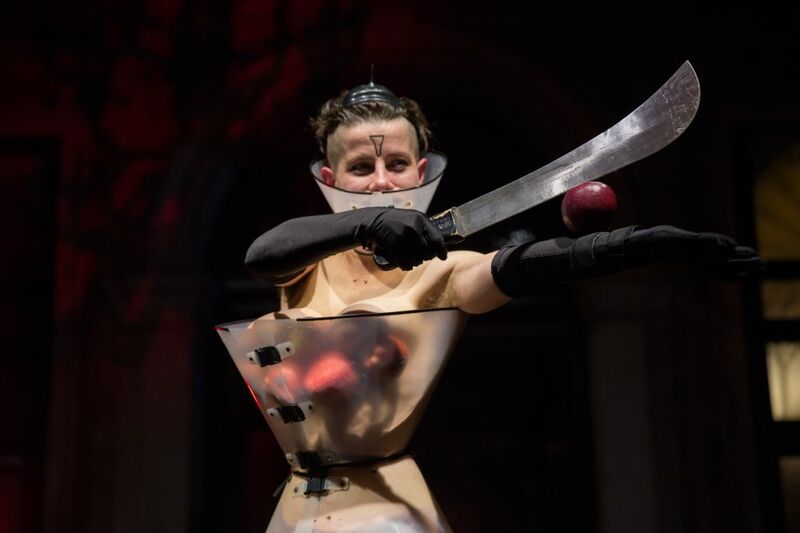 La Pocha Projects range from performance solos and duets to large-scale multi-sensory performance installations involving photo, video, sound and projection. At the VENICE INTERNATIONAL PERFORMANCE ART WEEK, Guillermo Gómez-Peña, Balitronica Gómez, Roberto Sifuentes, Dani d'Emilia and collaborators Samanta Cinquini, Giorgia de Santi, Micaela Leonardi, Gabriele Longega, Federica Montesanto, Francesca Carol Rolla, Stefania Soskic and Ilaria Zanella present the new live performance Corpo Insurrecto. La Pocha Nostra. Dani d'Emilia in Corpo Insturrecto. Venice International Performance Art Week (2014). Photograph by Monika Sobczak. La Pocha Nostra. Dani D'Emilia and collaborator Gabriele Longega in Corpo Insturrecto. Venice International Performance Art Week (2014). Photograph by Monika Sobczak.